Target 5: Severe Rent Burden | Propel L.A. In Los Angeles County, 54 percent of residents rent the homes in which they live. Data reveals that more than half of renters in the region are rent-burdened, which means they spend 30 percent or more of their household income on rent. There are two levels, ranking the severity of rent burden. Moderately burdened households are those that spend 30 to 50 percent of household income on rent, while severely burdened households are those that spend more than 50 percent of household income on rent. To set a rent target, we compare the percentages of households that are severely rent-burdened in California and Los Angeles County. 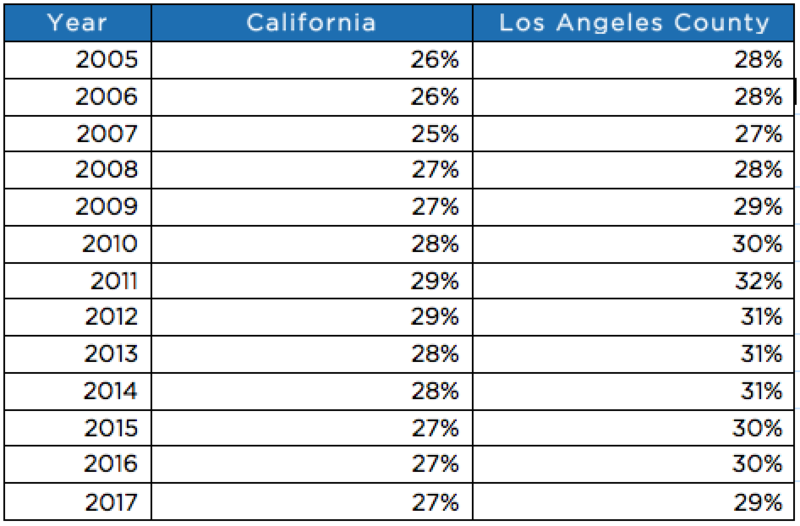 (Figure 8) Los Angeles County has a higher percentage of severely rent-burdened households than the state. Between 2005 and 2017, the average percentages of severely rent-burdened households in California and Los Angeles County are 27 percent and 30 percent, respectively. Using the state’s average as our target, we hope to see the number of severely rent-burdened households in Los Angeles County decrease to 27 percent or less by the end of 2020. Table B25070, 2017 American Community Survey 1-Year Estimates and Propel L.A. Analysis. Versions of this table are available starting in 2005. The latest available data is from 2017 as of the time of publication.